1. Cut out all fabric and interfacing pieces as per the measurements listed in the "Materials" section. 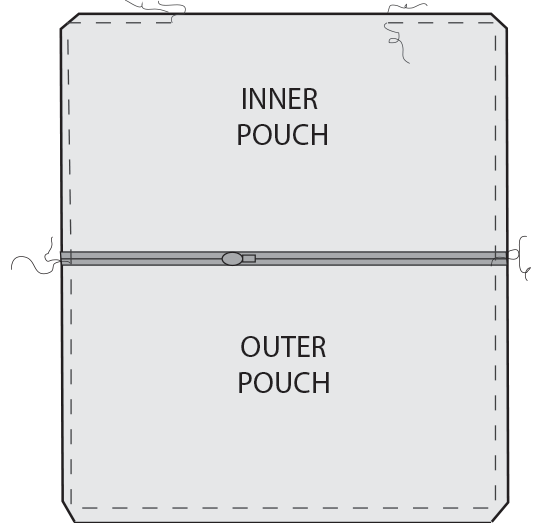 Set aside your 2 pieces that will be your "Outer Pouch" pieces, 1 of your "Pocket Flap", and 1 of your "Pocket". 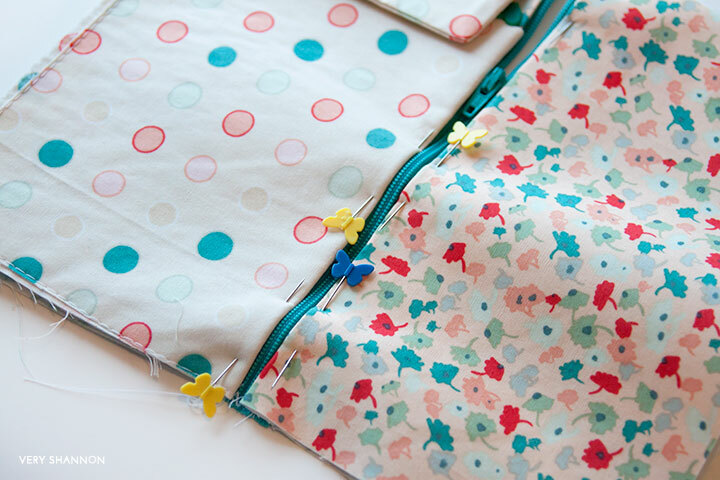 Iron your fusible interfacing to the wrong sides of these pieces. allowance. Turn right side out and press. *See diagram above. Place your Pocket Piece (right side facing up) on top of the right side of one of your Outer Pouch Pieces aligning both short ends together on the right edge. Pin your pocket down and baste close to the edge along the right short edge and along the bottom edge of your Outer Pouch Piece ONLY. This will keep your pocket piece from moving around too much when we assemble the pouch. *See diagram above. Now fold down 1/2" and press along one long edge of all of your Outer Pouch and Inner Pouch Pieces. Next place your Flap Piece right side facing up on top of the same Outer Pouch Piece you just sewed your pocket to (right side up) and pin it down 1/2" away from the bottom of your pouch aligned with the left hand side of the pouch. Baste along this side seam close to the edge. 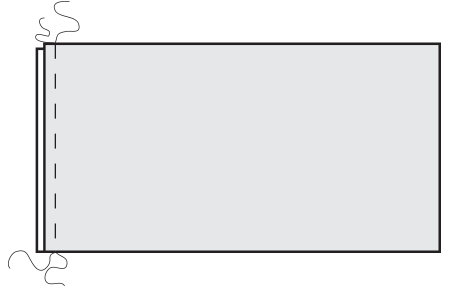 *See image above. Click on the links below to learn how to attach a zipper. Lay your Inner Pouch right sides facing down (your zipper will be right side facing up now) and pin your Outer Pouch Pieces down along your zipper making sure your zipper pull (start) are on the left side (same side as your pocket flap). Sew along your top edge as close to the zipper teeth as possible (don't sew on the teeth). You want a nice and tidy finish. 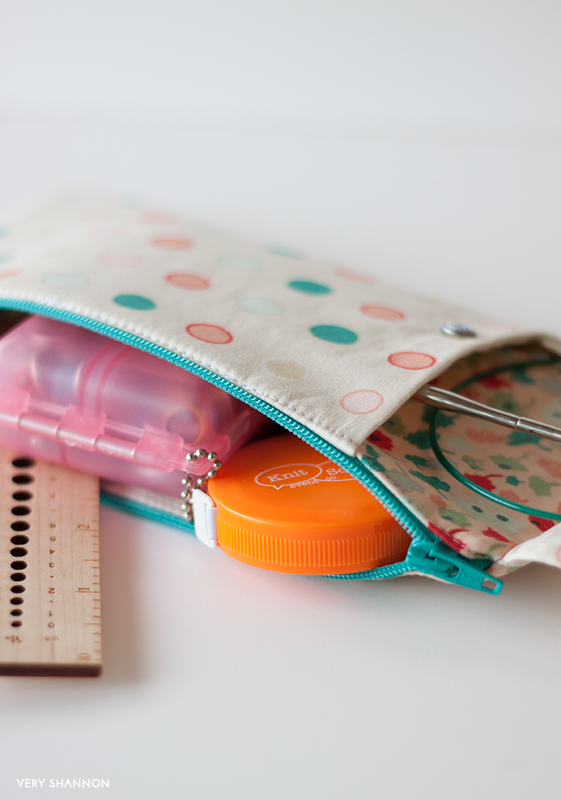 As you sew you can maneuver and move the zipper pull out of the way. See the picture below. Next repeat the above step for your other Outer Pouch Piece. When you are done pull your zipper down a few inches. You will need the zipper open so you can pull the pouch right side out after we are done sewing it together. Now we are going to finish sewing up the pouch. We are going to separate the Inner Pouch from the Outer Pouch here. So match your Outer Pouch right sides facing each other and pin around (leaving the Inner Pouch pieces free. Make sure that as you pin your zipper tops are even and lined up. *See diagram below. 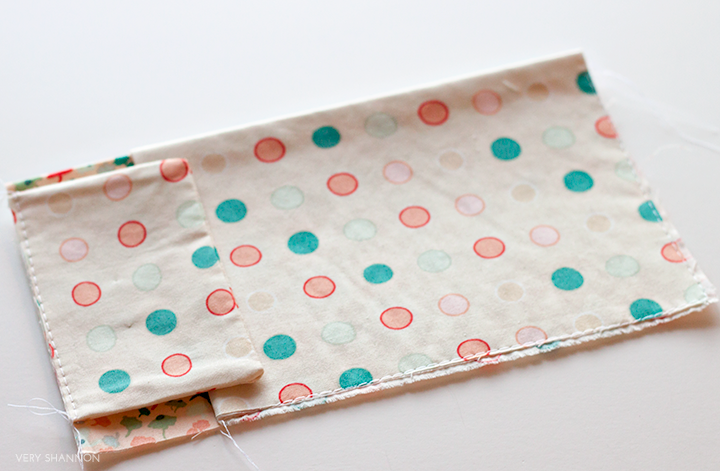 Sew along your 3 edges of your Outer Pouch ONLY with a 1/4" seam allowance going slowly and carefully. *See left diagram above. Now trim your corners to get rid of extra bulk. 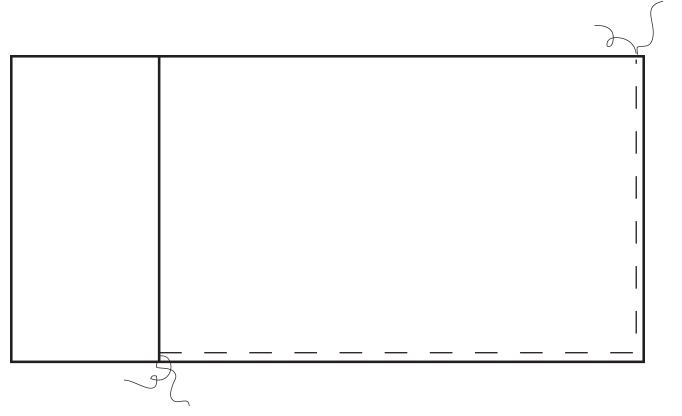 *See diagram to the right above. Next do the same steps but this time using your Inner Pouch Pieces (again lining everything up and pinning) but leave an opening that is 4-5" wide to turn your pouch through. Trim your corners. *See diagram below. Now pull your pouch right side out through the unsewn opening in your Inner Pouch. It is going to look weird and wonky but don't worry - all will be lovely soon. Once it's right side out put your Inner Pouch inside of your Outer Pouch and check to make sure all looks good. Check your pocket and flap to make sure it's laying nicely. If it does pull your Inner Pouch back out and either press and sew shut on your machine with a top stitch enclosing your unsewn opening or hand stitch the opening closed with an invisible stitch for a clean finish. Put your Inner Pouch back in your Outer Pouch and press. All we have left is to sew on your snap! 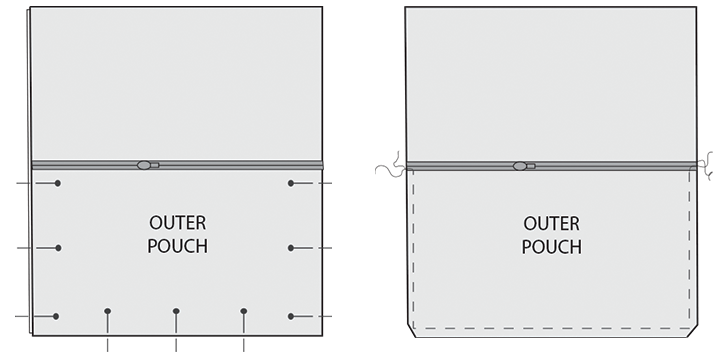 Find the center of your pocket flap and draw a dot 3/4" up from the bottom of your flap. Sew the female part of your snap here (or the part of the snap that has the opening (not the prong). Now find the center and mark the corresponding spot on the top of your pocket and sew down the male part of your snap (the one with the prong).